Last week, I kicked off the different types of nudges and how they apply to choice architecture with incentives. The word NUDGES is an acronym for the categories of nudging, and we are breaking those down episode by episode over six weeks to showcase different aspects of choice architecture and nudging. [02:56] Thaler and Sunstein describe a mapping as “the relation between choice and welfare” and use a simple example of choosing a flavor of ice cream in one of their papers on choice architecture. [03:30] At its core, the path from the choice and its outcome is called a mapping. [03:50] For ice cream, you have some mapping in your brain that let you know which flavors you would enjoy the most. [04:20] It’s more difficult to see the mapping with more complex choices. [04:49] Their paper uses the options of surgery, radiation, or watchful waiting with a cancer diagnosis. Comparing the options weighs a longer life against negative side effects. [05:45] In spite of this, most patients decide which course to choose at the very first meeting when they are given the diagnosis. The option they choose also depends strongly on the type of doctor they see. [06:44] My five steps for a choice architect to make the mapping as clear as possible: 1) encourage thoughtful review and open-mindedness, 2) break it down, 3) make it relatable, 4) help them get there, and 5) call to action. [07:25] With big decisions it’s important to understand your biases. [08:21] It’s important for doctors as the choice architects to understand the way they are framing the options. [09:29] Our brains put more weight on the default or what we hear about first. [10:02] The best choice architect should know that a person shouldn’t make a decision when they are highly emotional. [11:06] Breaking it down. If you want to make a map, it’s important understand all of the options available. [12:41] That way you can anticipate the questions a potential customer (or patient or client) will have, the things they need to know, and guide them to the right recommendation. [13:11] Make it relatable using simple rules of thumb. [13:56] Use the customer’s language and an example that they can relate back to. [15:16] Find the thing that customers care the most about. [15:50] The way you build your choice architecture is to think about how your customers will determine what to buy. What is the primary reason they are buying? [16:06] What do your customers need to know or hear, and what rule of thumb will make the choice simple and easy to make? [16:51] Once you know what your customers need, they still may require a little sample to get there. Incorporating the senses can help them make a decision. [17:44] Your call-to-action is the final step – it is important because it helps the chooser realize it is an appropriate time to stop analyzing and consider making a choice. [18:41] It’s also important to prime all throughout the interaction. [19:15] To encourage thoughtful review, an air conditioning company should know that the customer has other options. [20:11] Frame the cost in a relatable way. [21:49] Relating their mindset to the right point is your “taste test” when they can’t have a physical sample. [22:23] Ask for the sale…and then stop and wait. [23:52] If you use a script, understand the intent behind the script and know the content by heart in order to have a true conversation. [24:12] Price is never about price. It’s about all of the things leading up to the price. 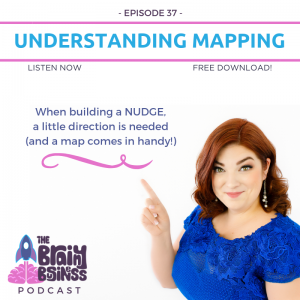 [25:42] Here are some basic mapping examples (because the final installment of the series – the “S” in nudges – is for structuring complex choices). [26:29] Using a menu to break options down into manageable chunks. Well worded descriptions help you evaluate if the item is something that you would like. [28:10] One well chosen word can make your brain want to read the description. [30:00] Our subconscious brain can take in a lot of information and glosses over a lot of things. [31:03] These menu descriptions include some taste words as well as relativity, anchoring and adjustment, and framing. [31:55] A nail salon example. [33:47] Adding more may seem like a benefit, but when it doesn’t have a useful map so the chooser can compare, adding more options can cause a lot more harm than good. [34:47] When creating a product website, consider what you present from the mind of the customer (think back to the menu example). [36:30] With a service website keep in mind the concept of incentives. [38:00] How our brain sees miles per gallon wrong, and why gallons per mile is better (yes, they are different). [39:54] How can you put numbers out there that are easier for people to understand and see the value? [40:05] Thaler and Sunstein recommend a system called “RECAP” which stands for Record, Evaluate, Compare Alternative Prices. [41:24] What if movies did not have trailers or descriptions? Trailers help you map the available movies and decide what you want to see. [42:45] Commercials take advantage of mirror neurons in the customer’s brain by showing someone else using the product, tasting it, picking it out from a menu or off a shelf. [44:54] The visual is best for the subconscious. [45:09] Any type of company – whether you sell physical products or a service – can use a guarantee of some kind. [45:58] Simple Tip You Can Use Immediately: use a call out or title like “Most popular” or “top choice” or “best value” – know, of course, that you are responsible in your business to ensure that it true. [46:45] Remember, the intent of a nudge is to help people make the best decision, but they must maintain free choice.